Kill Anything That Moves: The Real American War in Vietnam (New York: Metropolitan Books, 2013), by Nick Turse, is an amazing book. I hated reading it. I hope every reader feels the same, and that he has lots of readers. This is the book that pulls together all the threads of horror stories that the antiwar movement shouted to our home communities, to our elected leaders, and to our war-supporting corporate newspapers that censored us and provoked us to create the independent, antiwar underground press. But I felt obligated to finish it. As a good American who loves my country even while I despise our corporate foreign policy, I felt obligated. As a Jew who is motivated more by our tradition of “Do not do unto others as you would not have them do unto you” (Jesus stole this one from Hillel and got rid of the double negatives; as a professional editor, I would have done the same) than I am by mindless rituals of religious fanatics who cite God and creative bigotry to claim control over where Palestinians live and Jewish women pray, I felt obligated. As a practicing zen phony who sees everyone and everything as part of the same whole, I felt obligated. Every chapter recounted instances of American atrocities against the Vietnamese people. The message was that My Lai, the massacre that shocked our collective conscience when it was exposed, was not an exception. It was the rule. And, in fact, it wasn’t even the worst example of the rule. Turse names names and provides statistics. Most touching were the interviews with Vietnamese survivors. It was easier to condone their deaths, or to not be moved to action by them, when they were faceless. It is impossible now if you have any humanity, though it is still possible with our recent and current wars in the Mideast. Those books remain to be written. The notion that Vietnam’s inhabitants were something less than human was often spoken of as the “mere-gook rule,” or, in the acronym-mad military, the MGR. This held that all Vietnamese—northern and southern, adults and children, armed enemy and innocent civilian—were little more than animals, who could be killed or abused at will. The MGR enabled soldiers to abuse children for amusement; it allowed officers sitting in judgment at courts-martial to let off murderers with little or no punishment; and it paved the way for commanders to willfully ignore rampant abuses by their troops while racking up “kills” to win favor at the Pentagon. And so during the Vietnam War years we read in the corporate media about how the Vietnamese would walk behind their children so that any bombs that lay hidden in the fields would be detonated by the touch of the children and spare the adults. 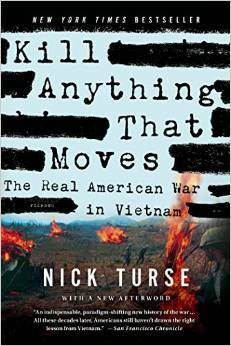 In Kill Anything That Moves, Turse reveals that it was the GIs who made the Vietnamese walk in front. We leveled hamlets, killed northerners (the “enemy”) and southerners (our “allies”) equally, indiscriminately murdered noncombatants, raped women, and, yes, killed babies. As I read about one atrocity after the next, I wondered how I would summarize them in a review. Would I choose one instance over another and call it the worst? Would I list several and call them typical? Would I reel off a string of statistics so gruesome that they become numbing? In the end, I closed the book and my eyes, then opened both and pointed. I found my finger pointing to page one of chapter 6, titled “The Bummer, the ‘Gook-Hunting’ General, and the Butcher of the Delta.” I encourage you to get the book so you can read about the latter two perverts. Sergeant Roy Bumgarner of the army’s 1st Cavalry Division and then 173rd Airborne Brigade in Binh Dinh Province, a soldier who reportedly amassed an astonishing personal body count of more than 1,500 enemy KIAs [killed in action], sometimes logging more kills with his six-man ‘wildcat’ team than the rest of his 500-man battalion combined. Private Arthur Williams, a GI who was repulsed by what he saw (and he was hardly the exception; the same was true of many GIs throughout the war), reported on Bumgarner’s leading role in multiple incidents of murder of unarmed farmers and children and was labeled a malcontent. The extended passage goes on to give further examples of Bumgarner’s actions and note GIs who leveled charges against him. At his subsequent trial, however, “superior officers and fellow sergeants lined up to praise the thirty-eight-year-old sergeant as a model combat leader.” In his own testimony, he showed off the medals he had earned, including a Silver Star, the third-highest military decoration awarded for valor in combat. One of the witnesses was a GI who had formerly spoken out against Bumgarner. By the time of the trial, he had, assumedly under pressure, recanted his testimony and now supported Bumgarner. In the end, Bumgarner was in fact convicted, but only of unpremeditated murder. He never spent a single day in prison for his crimes. Instead, for the deaths of three innocent Vietnamese civilians, he was sentenced only to be reduced in rank and fined ninety-seven dollars a month for twenty-four months. On appeal, that, in turn, was reduced to six months. He continued to serve in Vietnam. While reduced in rank to a private, he eventually made it back to sergeant. Just how many civilians died at Bumgarner’s hand will never be known, but we do know this: He killed innocent people simply because they were Vietnamese and then labeled them as enemy dead. He mutilated bodies and planted weapons on those he murdered to conceal his crimes. He instructed subordinates to take part in his misdeeds and then help cover them up. And he trained countless impressionable young men in his methods. The military knew all of this and still welcomed his continued service. Roy Bumgarner could have been stopped, but instead the military was his enabler. Here I disagree with Turse. In particular, I object to the word “enabler.” The connotation is that he had a problem and the military passively encouraged it by not actively discouraging it. Think Uncle Joe the drunk who is treated as the life of the party because of his hilarious inebriation-induced antics instead of the sick alcoholic in need of help that he is. Uncle Joe’s family members may not call him out for his sickness but you know that the healthier members are at least embarrassed by him. Certainly they don’t hold him up as a shining role model for the next generation. The military did. They didn’t just enable Bumgarner. They created him. They actively encouraged him. They benefited from his actions. They rewarded him and allowed him to train his young subordinates to become like him. Our troops came home from Vietnam craving a welcome-home parade. They wanted to be treated like heroes, like the returning World War II veterans. But they weren’t heroes. Individuals like Private Arthur Williams performed heroic acts, but how, in general, can our GIs have been heroes when they fought on the side of the bad guys, which is where history has solidly placed the United States? Our government was the enemy. Those GIs who were drafted against their will or who enlisted willingly but had their eyes opened once they were overseas were victims. When we honor them this Memorial Day, how about offering a national “We’re sorry”? How about promising, in their honor and the memory of those who are no longer with us or are living in cardboard boxes, to never again send young soldiers—or drone missiles—off to countries where we are not wanted and that have not threatened our national security? How about honoring our veterans by giving them medical care to at least alleviate the damage that we caused them; and then providing them with decent jobs to help them live decent lives and raise decent, peace-loving families here at home? During the Vietnam War, the antiwar community on both sides of the ocean were the heroes. In the military, the greatest heroes were those GIs, in every branch of service, who courageously turned against the war. Turse notes that “By 1971, antiwar GIs were producing hundreds of underground newspapers that encouraged disobedience and rebellion.” More clearly, as Harry Haines and James Lewes have documented (see Insider Histories of the Vietnam Era Underground Press, Part 2), over 500 underground newspapers were published by or directed to members of the military, all branches. Further research by Lewes since the book’s release has uncovered at least 300 more. These GIs were heroes. On this Memorial Day, let’s follow the parades led by veterans of the GI underground press and by members of the heroic Vietnam Veterans Against the War and the successor groups that have been inspired by subsequent wars in Iraq and Afghanistan. In this coming year, let’s work to reduce the number of future veterans.